Hillary Rodham Clinton was elected United States Senator from New York on November 7, 2000, making her the first First Lady of the United States to hold elective office. In 1977, President James Earl “Jimmy” Carter appointed Hillary Rodham Clinton to the board of Legal Services Corporation, an organization that disbursed federal money to legal aid bureaus nationally. She founded the Arkansas Advocates for Children and Families and, in 1978, was named to the CDF board (chairing it from 1986 to 1989). In 1992, she campaigned widely for her husband, who was elected U.S. President that November. For eight years, she served as an active First Lady, working on health care reform, children’s issues, and women’s rights. Senator Clinton’s work focused on creating great economic development opportunities for her constituents; increased access to health care and education; energy independence through development of alternative fuel and energy resources; and security at home and abroad. She won support for legislation to clean up industrial pollution for economic development, to ensure the safety of children’s medicine, and to repair and modernize schools. After the September 11, 2001, attacks, Senator Clinton worked tirelessly to enable New York to recover, including ensuring adequate federal funds for rebuilding. She also won passage of legislation improving communication for federal and local emergency first responders.6 As a member of the Armed Services Committee, Senator Clinton led the bipartisan effort to extend health care benefits to members of the National Guard and Reserve. In the fall of 2006, Hillary Rodham Clinton was re–elected to a second term in the Senate, winning 64 percent of the vote against Republican candidate John Spencer. 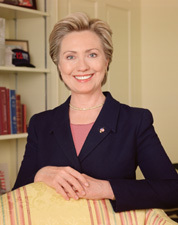 In 2007, Senator Clinton declared her candidacy for the 2008 Democratic presidential nomination. In an historic primary season, she lost the nomination to Senator Barack Obama of Illinois. Following his presidential election victory, President–Elect Obama nominated Hillary Rodham Clinton as Secretary of State on December 1, 2008. On January 21, 2009, following Senate approval of her nomination, Clinton resigned her Senate seat to assume her duties as Secretary of State. 1“Hillary Rodham Clinton” Current Biography, 2002 (New York: H.W. Wilson and Company, 2002):93–94. 2Current Biography, 2002: 94–95; Politics in America, 2002 (Washington, D.C.: Congressional Quarterly Inc., 2001): 671. 3Adam Nagourney, “The Senate Campaign—the First Lady,” 18 September 2000, New York Times: A1. 4“Election Statistics, 1920 to Present,” http://clerk.house.gov/member_info/electionInfo/index.aspx; Politics in America, 2002: 671. 5Politics in America, 2002: 671; Almanac of American Politics, 2002 (Washington, D.C.: National Journal Inc.): 1047. 6Congressional Record, Senate, 107th Cong., 1st sess. (3 December 2001): 12298; Frank Bruni, “Show Us the Money,” 16 December 2001, New York Times Magazine: 60. See also John F. Harris, “Hillary’s Big Adventure,” 27 January 2002, Washington Post Magazine: W8; “Official Biography of Hillary Rodham Clinton,” http://clinton.senate.gov/about_hrc.html (accessed 14 December 2004). 7"Hillary Clinton Bio," available https://www.hillaryclinton.com/about/hillary/ (accessed 31 January 2017). Clinton, Hillary Rodham. An Invitation to the White House: At Home with History. New York: Simon & Schuster, 2000. ___. Hard Choices. New York: Simon & Schuster, 2014. ___. It Takes a Village: And Other Lessons Children Teach Us. New York: Simon & Schuster, 1996. ___. Living History. New York: Simon & Schuster, 2003. "Hillary Rodham Clinton," in Women in Congress, 1917-2006. Prepared under the direction of the Committee on House Administration by the Office of History & Preservation, U.S. House of Representatives. Washington, D.C.: Government Printing Office, 2006. U.S. Congress. Tributes Delivered in Congress: Hillary Rodham Clinton, United States Senator, 2001-2009. Washington: U.S. Government Printing Office, 2012.